Const. Kwesi Millington, the RCMP officer who fired a Taser the night Robert Dziekanski died eight years ago, has been found guilty of perjury. Const. Kwesi Millington, the RCMP officer who fired a Taser the night Robert Dziekanski died eight years ago at the Vancouver airport, has been found guilty of perjury and colluding with his fellow officers beforetestifying at the inquiry into the Polish immigrant's death. A B.C. Supreme Court judge ruled today that Millington "patently" lied at the Braidwood inquiry into the fatal confrontation at Vancouver International Airport in 2007. Millington fired his Taser multiple times after he and three other officers were summoned over calls that Dziekanski, who spoke no English, had been throwing furniture in the international terminal. Each of the officers was compelled to explain his actions at the inquiry and all four were later charged with perjury. Millington was accused of lying 10 times at the inquiry, including about whether he thought Dziekanski was standing or on the ground after the first shock from the Taser. Judge William Ehrcke said it was "preposterous" that the Mountie claimed Dziekanski was standing while he was stunned a second time, when it's clear from bystander video that Dziekanski was already on the ground. "The Crown has proven beyond a reasonable doubt that Const. Millington gave oral evidence under oath which he knew at the time to be false, and he did so with the intention to mislead the inquiry," Ehrcke said Friday as Millington listened from the prisoner's dock. Dziekanski's mother, Zofia Cisowski, sat quietly in the public gallery as the judge read the verdict. Perjury charges were laid against Const. Gerry Rundel, Const. Bill Bentley, Cpl. Monty Robinson and Const. 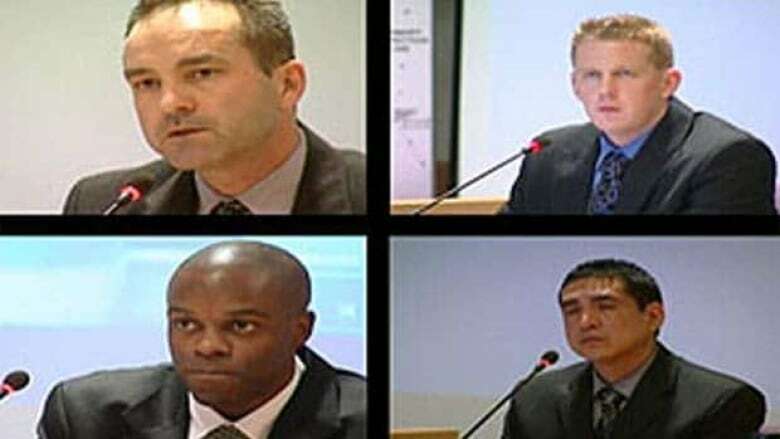 Kwesi Millington, clockwise from top left, in connection with their testimony at the Braidwood inquiry. (CBC)​Millington's verdict marks the first time a judge has concluded that one of the officers in the Dziekanksi affair lied. It's also the first time a judge has agreed with the prosecutors who argued that Millington and his fellow officers conspired to lie and exaggerate the threat Dziekanksi posed in order to justify their use of force. One of the other officers charged with perjury, Const. Bill Bentley, was acquitted of perjury in 2013, but the Crown is appealing that verdict. A witness connected to Bentley testified at Millington's trial and said officers met at her home. But the defence presented telephone records, credit card receipts and other evidence to portray her testimony as unreliable and motivated by acrimony. However, Ehrcke concluded the officers must have spoken to each other before providing statements to homicide investigators. "This the only rational inference available," he said. Millington testified at his trial that he made mistakes in describing what happened, but insisted they were the product of a fast-moving and traumatic situation. His lawyer argued the officer had no reason to lie, because the moment Dziekanski picked up a stapler, it became a weapon that justified the use of force. Former corporal Benjamin (Monty) Robinson is awaiting a verdict and Const. Gerry Rundel's trial, which proceeded in another courtroom on Friday, is almost finished. Millington has remained on duty with the RCMP, but has been sidelined from regular duties. His next court appearance will be on March 19. Criminal Justice Branch spokesman Neil MacKenzie said the special prosecutor will decide whether to ask for jail time. He also said it's unclear what effect the Millington conviction will have on Bentley's appeal. "I had always hoped … I could jump to the sky," said Cisowski after the verdict was handed down. She said it was the first time she has been happy since her son died. "I am pleased to hear the judge found him guilty of six of the 10 perjury charges. Even with six, I am not satisfied, but it's better than nothing." She added she would like to see Millington end up in jail, because "they killed" her son, even though Millington was only found guilty of perjury. "I am very concerned because they didn't find criminal charge for killing Robert," she said. She now lives in Kamloops, B.C., where Dziekanski had planned to move after immigrating to Canada.